Robert Storey assegna al gruppo Nobodies un nuovo ciclo di canzoni scritte a quattro mani con Rachel Gardner a proposito di rapporti che si deteriorano, nevrosi, conflitti personali, abbandoni e mille altre pene della vita di coppia. 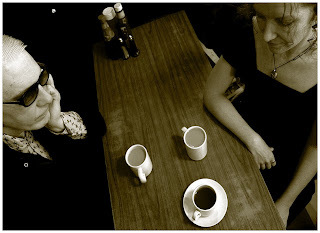 Le presenta con sorriso smorzato - ma con il garbo e l'ironia delle precedenti esperienze Orchestre Murphy/Miners of Banal - nell'album Cup of Tea, pubblicato per l'etichetta download-only inaugurata pochi giorni fa da Bob Drake: "It has happened occasionally - scrive Drake - that a group or a person will come to my studio, we spend a week or two recording a batch of songs, I spend another week or two doing the mix and careful mastering and it turns out a real good album… and then it never gets released. Or a few hundred CDs are pressed then it goes out of print presumably for eternity, maybe available only as poor quality mp3 giveaway on someone’s blog. It seemed a shame, so I finally started a pretend “label” page where you can listen to or buy downloads of such albums".